We had the chance to interview Emil Jonsvik, the director of Marie’s latest video “Sista sommarens vals”, taken from her latest album “Nu!”. Emil told us about his career and the shooting of the video with Marie. Judith: To start with, could you tell us about you? When and how did you get into filming and directing films? Emil: I was born in Gothenburg, Hisingen 1978. I started producing my first films at the age of 12. This was for Swedish television (ZTV) and the film was “Gold”, which was a skateboard movie. When I look back on it I see that I already then wanted to create drama in film. I used scenes with actors walking through smoke in slow motion with strong cinematic music. After that I produced the Award winning break dance documentary “Shindig” and two other dance movies, “The Book” and “No One Knows Our Thoughts”. They were about winning over your inner fears. In 1998 I went to a film school, “Film I Väst” (Trollywood), and started working with blockbusters as “Santa is the father of all the children” and “A Witch in the Family” as a lighting designer and set lights along with being the cinematographer on location. I met the director Daniel Fridell which started a long cooperation, among others I became a cinematographer on his award winning TV series “A Class Apart” as well as the movies “Sökarna 2” and “Blood Brothers”. After that I directed the very popular television program (with over 1.5 million downloads on YouTube) “Late Night with Pierre” with little Al-Fadji for Swedish television (SVT). After that came my debut as a feature film director with “7X / Seven Bullets”. This movie was about seven kids that find a gun with seven bullets. This is a multiple award winning film including awards for “Best film” and “Best director”. Now I’m in the final cut with my new feature film “Krigarnas ö” (The Name of the Game) with the great actor Kim Bodnia known from TV series “The Bridge / Bron”. An exciting drama / thriller. J: What do you like about being a director? E: I love the creating process. To take a idea, put it down on paper and then manage to make these scenes come alive, that’s where my drive comes from. I get inspired by many different kinds of films in different ways. I love movies like “City of God” and “La haine” but I can also find inspiration in films like “The Last Samurai” and “The Driver”. J: You started mentioning inspiration, but what do you want to tell with your videos? what do you think is your “trademark” and what makes you different from other directors ? E: I get inspiration from people’s energy, music and films. In meetings with actors and artists, I often feel what they want to create together, it is important that I together with the team create the best energy on location for the shoot. Because of my broad experience with film production it’s easier for me to decide what to focus my energy on which makes my work very efficient. This ultimately results in me laying my energy on the right stuff. I want to get the artist and the actors to have trust and feel secure with me in order to create magic together. That’s what makes every difference, and that’s my “trademark”. J: Now about the video you did for Marie: how come you ended up doing the video? Did Marie or her management ask you? As Warner Music Sweden informs, ”Sista sommarens vals” is Marie’s 2nd single off “Nu!” and it will premiere in Skavlan this Friday. Skavlan is a Norwegian-Swedish television talk show hosted by Norwegian journalist Fredrik Skavlan. The show will be on air on SVT and it will also be available on SVT Play. The show with Marie starts at 21:00 CET, 22nd November. Not sure the video clip, which we’ve already informed you about will appear in the show, too or if there is an interview as well, but Marie will surely sing the song. Woohoo! Lyrics to track 4 and 5 on Nu! Today we got 2 new beautiful songs from Marie’s album. One of them is “Längtan”. 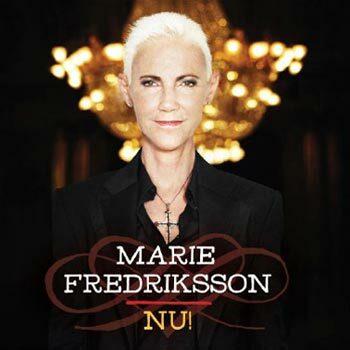 We had the info that Marie has written only one song for this album and we knew it was another one, but still, having the same title as an earlier song of hers made us think it might be a remake of “Längtan” (written by Marie Fredriksson and Lasse Lindbom) from Efter stormen album. Now it turned out it’s a completely new song. The other song for today is “Sista sommarens vals”. A real gem! This is the song written by Marie. The one that will also have a video clip. The whole waltz is so soft and the lyrics are so touching. I really hope to hear this one live next year. Marie’s new album ”Nu!” is out on 20th November and it seems that there will also be a music video. The only song Marie wrote for this album is ”Sista sommarens vals” and director Emil Jonsvik is already working together with Ms Effe on shooting a video for this song. Awesomeness! The black & white video is being shot mostly at Hotel Diplomat in Stockholm. Thanx for letting us know, Ivan Kelava & for your cooperation, János Tóth.